Send us a friend over to Menke's Auto Repair shop in Newburgh, IN and we will give you $20.00!! For every new customer you send to Menke's Auto Repair, that has any kind of service work performed, we will send you $20.00!!! The new customer will receive a 10% discount on service work we performed on their FIRST VISIT, when they bring in a copy of this coupon. (Discount not to exceed $50.00) Print or share this coupon to a friend to take the first step to you earning $20.00!! 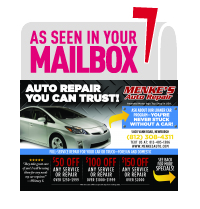 We are proud to say that MENKE'S AUTO REPAIR is celebrating our 40th YEAR in business. For the first 18 years Vernie worked by himself while the business continued to grow. Then 22 years ago Vernie built the new facility which now employees 13 people, Our facility was expanded 3 years ago.. WE COULDN'T HAVE DONE IT WITHOUT OUR LOYAL CUSTOMERS. WE CAN'T THANK YOU ENOUGH!!! DON'T FORGET** WE Have A Fleet Of 30 FREE LOANER VEHICLE'S!!! Did you know we now offer 6 MONTHS FREE FINANCING (on qualifying purchases) for all your auto repair needs, just come in and sign up for our EASY PAY CARD, this will also extend your PARTS AND LABOR WARRANTY TO 3 YEARS / 36,OOO MILES!!! Started on time. Did the job in about 15 minutes (when a dealer in town sold me the part, but didn't know how to install it), & then said they would make time to do an oil change even though I hadn't told them ahead of time. Very courteous & even cleaned my window. Found a problem that can be fixed now for less cost, or pay a lot more later if they hadn't found it & it turned into something major. Well done as usual.